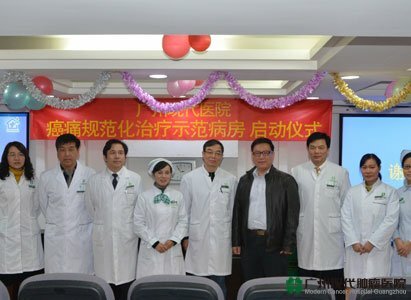 In the afternoon of 8th, Jan, 2013, the opening sitting of Cancer Pain Standardized Treatment Demonstration Ward Creating Project was launched in the 9th floor conference room of Modern Cancer Hospital Guangzhou. Professor Zhang Junyi from Southern Hospital attended the ceremony and delivered lectures at the meantime. Currently, only 2 hospitals have passed the examination and approval of Ministry of Health, and became "cancer pain standardized treatment demonstration unit" in Guangdong Province. As one of the hospitals, Modern Cancer Hospital Guangzhou has paid great attention on the management of cancer pain. The launch on Cancer Pain Standardized Treatment Demonstration Ward Creating Project will further strengthen the hospital’s cancer standardized treatment management, increase the standardization of cancer pain treatment level, improve cancer patients’ medical service level, safeguard the legitimate rights and interests of cancer patients, also improve their quality of life greatly. During the launching ceremony, Director Qin from the Department of Medical Administration firstly published a speech. 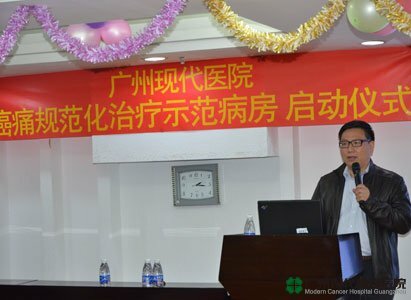 Then, Professor Zhang Junyi from Southern Hospital had his own explanation on the key points of the self evaluation of cancer pain standardized treatment demonstration ward. Successively, Director He from the Nursing Department introduced the nursing processes of "cancer standardized treatment demonstration unit " in detailed, and Director Yang from the Pharmacy laid out the management items on anesthesia and psychotropic medication step by step. In conclusion, all the meeting staffs discussed and summarized all the mentioned issues minutely and carried on a deeper discussion on the encountered problems and relevant technical specifications on cancer pain management. The whole launch ceremony was held in a sincerely warm and harmonious atmosphere.